Gregory Mankiw is a macroeconomist and a Professor of Economics at Harvard University. Economics is the study of how we can distribute the resources we have to the most people in the most efficient way. While some of the ten principles above may not directly affect your decision-making abilities, studying economics will. That’s why I’ve included them in this post. "Economics was always more multidisciplinary than the rest of soft science. It just reached out and grabbed things as it needed to. And that tendency to just grab whatever you need from the rest of knowledge if you’re an economist has reached a fairly high point in Mankiw’s new textbook Principles of Economics. I checked out that textbook. I must have been one of the few businessmen in America that bought it immediately when it came out because it had gotten such a big advance. I wanted to figure out what the guy was doing where he could get an advance that great. So this is how I happened to riffle through Mankiw’s freshman textbook. And there I found laid out as principles of economics: opportunity cost is a superpower, to be used by all people who have any hope of getting the right answer. Also, incentives are superpowers." Textbooks aren’t just for students, and opportunity cost and incentives play a huge role in our lives. Principle 1: People face trade-offs. You’ve heard the term “there’s no such thing as free lunch” a thousand times. It’s true, and despite being a cliche we often forget about it when making decisions. The crux of it is: to get something we have to give up something else. When someone offers you something for free, it’s probably not free. When you buy those new pair of shoes for $120, you’re giving up the chance to buy something else, or invest it in the markets. So whether you’re a student deciding how long to study for, a family deciding where to spend its income, a CEO mapping out where revenue will be spent, or a regulator deciding how to protect the environment without damaging the economy, you’re always facing trade-offs. Mankiw suggests that the trade-off that we face as society is between efficiency and equality. "Efficiency means that society is getting the maximum benefits from its scarce resources. Equality means that those benefits are distributed uniformly among society’s members. In other words, efficiency refers to the size of the economic pie, and equality refers to how the pie is divided into individual slices." "When the government redistributes income from the rich to the poor, it reduces the reward for working hard; as a result, people work less and produce fewer goods and services. In other words, when the government tries to cut the economic pie into more equal slices, the pie may get smaller." Some economists would argue that the cost of increased equity is a reduction in the efficient use of resources, that’s up to you to decide. Consider the decision to start a company. The main benefits are the chance to build a wonderful company, and the monetary benefits that come with that. But what are the costs? To answer this, you’d be tempted to add up the amount of money you’ll need for AWS, MacBook Pros, rent, staff costs, and your food/rent money. Yet this total won’t truly represent what you give up to start a company. There are two problems with this calculation: First, it includes some things that are not really the cost of starting a company. Even if you are working, you need a place to sleep and food to eat. Second, this calculation ignores the largest cost of starting a company – your time. When you spend a decade of your life working on a company that may well explode, you cannot spend that time working at a job. For most people, the earnings that you give up to start a company are the single largest cost. The opportunity cost of an item is what you give up to get that item. When making any decision, decision makers should be aware of the opportunity costs that accompany each possible action. In fact, they usually are. College athletes who can earn millions if they drop out of school and play professional sports are well aware that the opportunity cost of their attending college is very high. It is not surprising that they often decide that the benefit of a college education is not worth the cost. Principle 3: Rational people think at the margin. For the sake of simplicity traditional economists assume that people are rational. Now, there are behavioural economists that disagree with this assumption, and I do too. But there is some truth to it, too. People do try their best to achieve their goals, but they might not maximise their resources towards said goals. Economists call this marginal change, small incremental adjustments to an existing plan of action. In typography, a margin is the area between the main content of a page and the page edges. It helps define where a line of text begins and ends. So think of marginal change as deciding where you will start and end a behaviour. Thinking at the margin works for business decisions, too. Consider Uber deciding whether they should launch uberPool or not. For reference, uberPool matches riders heading in the same direction, so they can share the ride and cost. The thing Uber wants is to maximise the amount of time that a driver is driving around passengers. Any time that the car is empty, both the driver and Uber itself aren’t making money. And what’s an easy way to get more people to use Uber? Make it cheaper. How do you make it cheaper without damaging your margins? You charge the same, and let people share the cost. At least in theory. In practice, it depends on whether the people riding on uberPool would have used uberX if uberPool wasn’t available. In other words, when deciding to launch uberPool in a city, Uber would be thinking about the average cost of adding one more passenger to a car, but what is really important is the marginal benefit (or cost) that the extra passenger will create. As long as the extra passenger pays more than the marginal cost, uberPool is profitable. It really depends on whether the customer would have used uberX if uberPool wasn’t available. Humans need water to survive, while diamonds are unnecessary; but for some reason, people are willing to pay much more for a diamond than for a cup of water. The reason is that a person’s willingness to pay for a good is based on the marginal benefit that an extra unit of the good would yield. The marginal benefit, in turn, depends on how many units a person already has. Water is essential, but the marginal benefit of an extra cup is small because water is plentiful. By contrast, no one needs diamonds to survive, but because diamonds are so rare, people consider the marginal benefit of an extra diamond to be large. A rational decision maker takes an action if and only if the marginal benefit of the action exceeds the marginal cost. Principle 4: People respond to incentives. Warren Buffett also likes incentives, when asked about the deficit, Buffett said he could end it in five minutes. "I could end the deficit in five minutes. You just pass a law that says that anytime there is a deficit of more than 3% of GDP all sitting members of congress are ineligible for re-election." Buffett saying that we should give people the prospect of a punishment (ineligible for re-election) and a reward (eligible for re-election). And if congress are rational people (we assume they are), they should respond to this incentive. This idea can be extended beyond just individuals to the market as a whole. Incentives are crucial to analysing how markets work. For example, when the price of an apple rises, people decide to eat fewer apples. At the same time, apple orchards decide to hire more workers and harvest more apples. In other words, a higher price in a market provides an incentive for buyers to consume less and an incentive for sellers to produce more. As we will see, the influence of prices on the behaviour of consumers and producers is crucial for how a market economy allocates scarce resources. Principle 5: Trade can make everybody better off. Trade is not like a sport, where one side wins and the other loses. You compete with others to find the best job, and when you shop you’re competing with everyone else to find the best price. It sounds tiring, competing away, but the alternative, cutting yourself out of the market is worse. You’d have to grow your own food, make your own clothes, and build your own home. Trade allows each person to specialise at what he or she does best, whether it’s farming, sewing, or home building. In the same way incentives work for people and markets, so does trade. Nations often specialise in what they do best, and this generally leads to a wider range of options at a lower price. These days trade is a necessity. There is no longer enough arable land to support the billions of tiny farms that we would need to set up to survive without trade. Nor do many people want to. We take it for granted how natural trade feels, probably because we’ve been doing it since the early days. Principle 6: Markets are usually a good way to organise economic activity. The collapse of communism in the Soviet Union and Eastern Europe in the 1980s may have been the most important economic change during the last half century. Communist countries worked on the premise that government officials were in the best position to determine where scarce resources went. But central planners failed because they tried to run the economy with one hand tied behind their back – the invisible hand of the marketplace. In a market economy, an economy that allocates resources through the decentralised decisions of each economic actor, and how they interact in the markets for goods and services – the central planner is replaced by decisions of billions of market participants. It’s pretty amazing how you deciding where to work, what to buy, and where to live, combined with millions of other people’s decisions, creates something that, for the most part, works. Despite the majority being self-interested decision makers, market economies have proved successful in organising economic activity that promotes overall economic well being. Principle 7: Governments can sometimes improve market outcomes. Markets are usually a good way to organise economic activity, and governments can sometimes improve market outcomes. Generally, there are two reasons for a government to intervene in the economy: to promote efficiency and to promote equity. A good way to think about it is that economic policies generally aim to enlarge the economic pie, or change how it is divided. The invisible hand is usually quite good at this, but sometimes governments need to intervene. Economists call this a market failure – a situation where the market fails to allocate resources efficiently. One cause of a market failure is an externality. An externality is the impact of one person’s actions on the well-being of another. Pollution is an externality. If you don’t bear the entire cost of the pollution you emit, you’ll probably emit too much. In this case, a government may raise economic well-being through regulation, like a carbon tax. Another cause of market failure is when one person (or group) has control over market prices. A simple example is if one person owns all sources of drinking water, but everyone needs access to it. This may cause the government to regulate the price to avoid the monopolist charging in excess of economic efficiency. Principle 8: A country's standard of living depends on its ability to procude goods and services. "The answer is surprisingly simple. Almost all variation in living standards is attributable to differences in countries’ productivity–that is, the amount of goods and services produced from each hour of a workers’ time. In nations where workers can produce a large quantity of goods and services per unit of time, most people enjoy a high standard of living; in nations where workers are less productive, most people must endure a more meagre existence." I don’t necessarily agree with everything Mankiw says here, but there are similarities that you can apply to your own life. The more productive you are, the more valuable you are. "Knowledge and productivity are like compound interest. Given two people of approximately the same ability and one person who works ten percent more than the other, the latter will more than twice outproduce the former. The more you know, the more you learn; the more you learn, the more you can do; the more you can do, the more the opportunity — it is very much like compound interest." 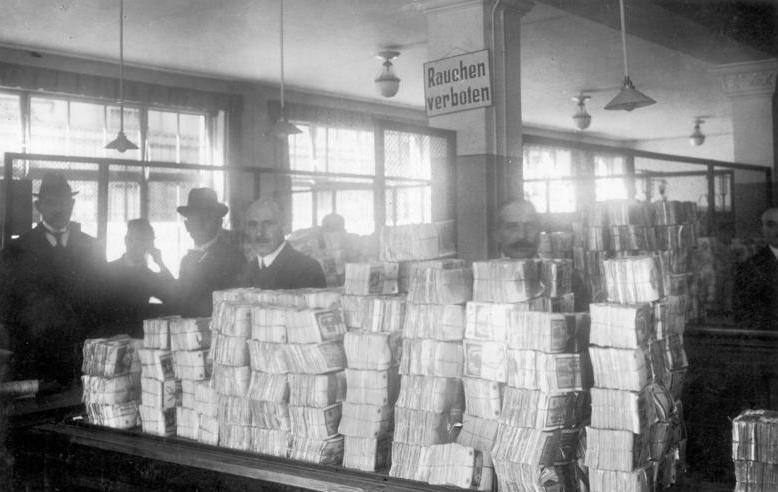 In Germany in January 1921, a daily newspaper cost 0.30 marks. Less than two years later, in November 1922, the same newspaper cost 70,000,000 marks. All other prices in the economy rose by similar amounts. This is inflation, a sustained increase in the general price of goods and services in an economy over a period of time. Or more specifically hyperinflation. In most cases of large or persistent inflation, the culprit turns out to be the same–growth in the quantity of money. Principle 10: Society faces a short-run trade off between inflation and unemployment. What this means is many policies push inflation and unemployment in opposite directions. This means you should be aware of business cycles–the irregular and largely unpredictable fluctuations in economic activity, as measured by the production of goods and services. While some of these principles don’t directly apply to making clearer decisions, a base understanding of economics will help you make better decisions. If you haven’t already read part one of our Economics 101 series, check it out.